As much as I love home made props and gaming memorabilia, there's something to be said for professional level craftsmanship. 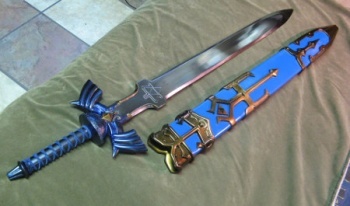 For instance: this gorgeous replica Master Sword from Fiberglass Blades. Crafted from "durable resin" reinforced with aluminum or fiberglass rods, the 3 lb. sword features a custom glossy automotive paint job, and a sheath made of foam and suede. Geekologie reports that these swords typically sell for $400 - $600, though no price has been established for this particular weapon. That may seem like a lot of cash, but if you consider that this replica is both one of the finest pieces of gaming nerd miscellenea available and a pretty viable way to murder intruders, it becomes a pretty attractive bargain.